I knew when the Mardi Gras parade came down the main aisle of the exhibit hall with the band playing Dixieland and masked characters throwing beads that this was not going to be your typical food show. With lots of revelry and champagne, the 60th “Toast to Talent” Louisiana Restaurant Show was a full three days of fun, southern hospitality and amazing aromas and tastes. Fortunately, my husband Dave and son Cole agreed to come along. Since we are all in the foodservice business, we could learn a few things at the show and explore the city together at night. When Sandy Riddle, Louisiana Restaurant Association (LRA) Exhibitors, called to invite me to speak at the LRA show this year I was so excited, but a bit sad too. I hadn’t been to New Orleans (NOLA) since my 20’s, before my celiac disease diagnosis (or as I like to call it “pre-CD”). I remembered all the amazing food like gumbo, etouffee, jambalaya and beignets, which of course all contain gluten, and all but the beignets contain roux. (Roux is a mixture of flour and butter cooked together until bubbly and brown. The desired color depends on what you are preparing and sometimes it can take a good long time of stirring and waiting to get the perfect color and taste.) But I was hopeful that I would find some new flavors and gluten-free foods while exploring the city. I’ve met some really nice people at various shows across the US and always enjoy that first day when I’m able to meet fellow vendors setting up in the same aisle. It’s also a good time to check out which spots will have safe food choices when you need a nibble to keep up the energy and pass the time. Luckily, I happened to be smack dab next to one of the most popular exhibitors, Your Way Cuisines, a gluten-free roux company. Kristie Buford and her husband Chad are brand new to the gluten-free industry and saw a need and decided to fill it. They have created two roux bases made from corn and sorghum and they’re delicious. I have not had gumbo in 20 years and the gumbo they prepared with their product was full-flavored with a nice, smooth back heat. That’s me! I truly love getting restaurants to understand safe gluten-free food preparation through the GREAT Kitchens program. 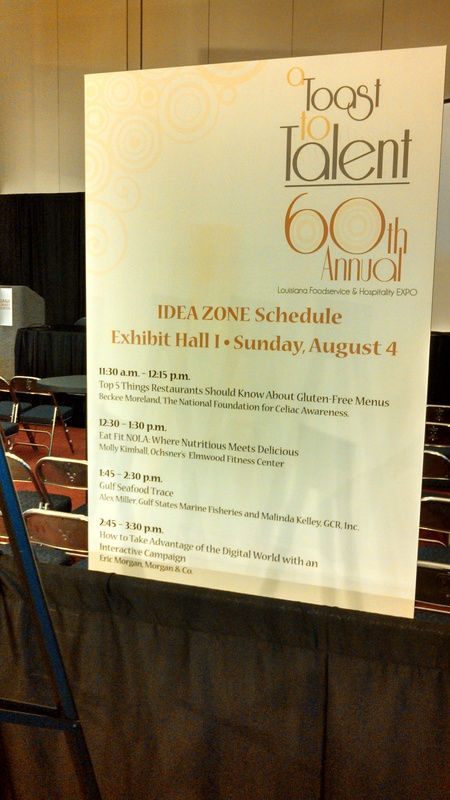 Speaking at expos like the LRA Show are amazing opportunities to raise awareness of celiac disease and the reason so many of us need gluten-free options. Evenings consisted of strolls through the French Quarters from Bourbon Street to the Riverwalk. We tried to get the full NOLA experience, a concert at Preservation Hall, a ghost tour, shopping and people-watching on Bourbon Street. 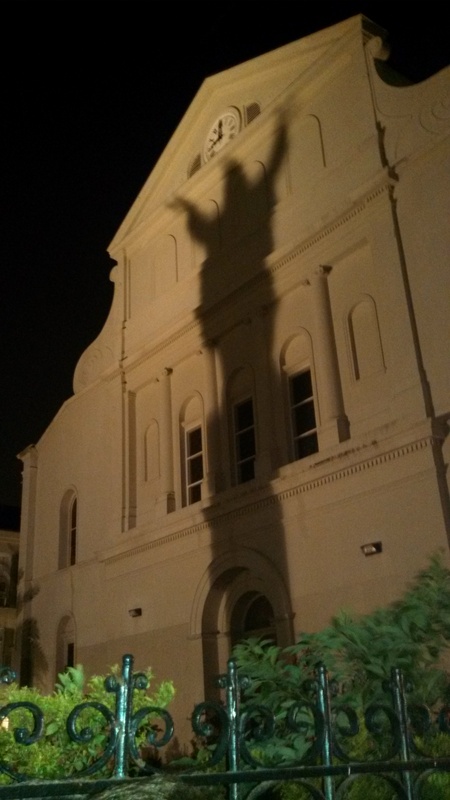 The start of the ghost tour – spooky! 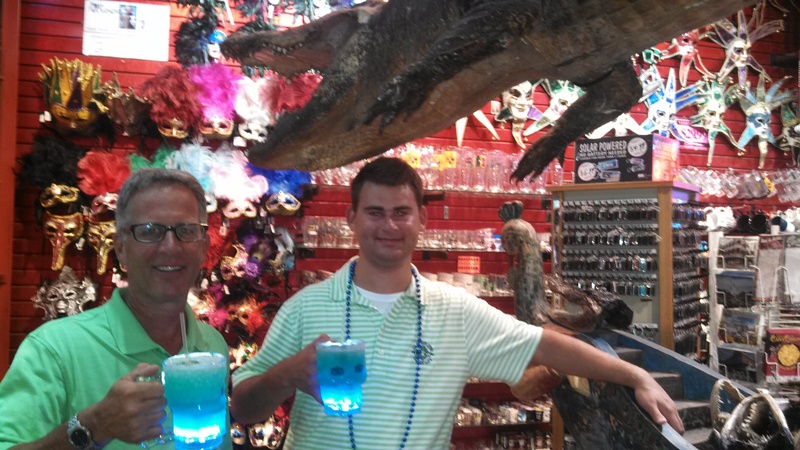 Of course my guys had to find the bar, “Spirits” from the TV show Bar Rescue and purchase some kind of voodoo potion. We did find some tremendous restaurants that offered gluten-free options. Red fish was a popular entrée at many spots especially at Redfish Grill. The chicken with jambalaya risotto was succulent and spicy at Bourbon House and the service was impeccable. 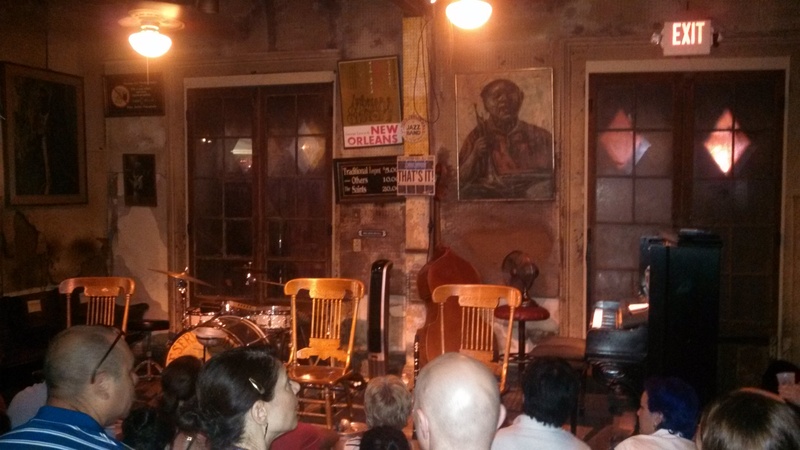 We really loved the music, atmosphere and Caribbean flavors at Rum House in the Garden District. 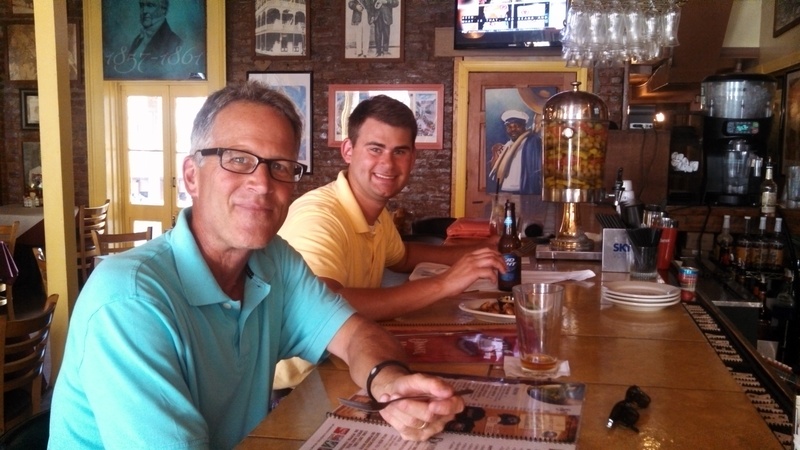 My husband Dave and son Cole at “Spirits,” enjoying their “voodoo” potions. 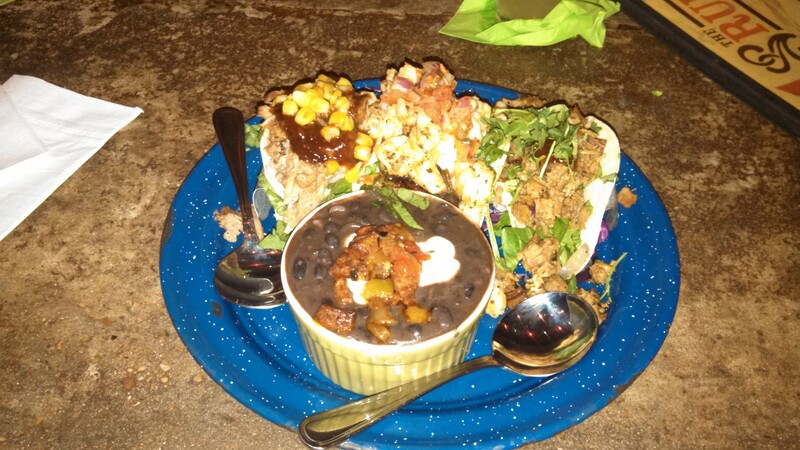 Gluten-free tacos and black beans. Yum! By day, I enjoyed meeting many of the chefs and restaurateurs from some of the famous and well-known establishments. 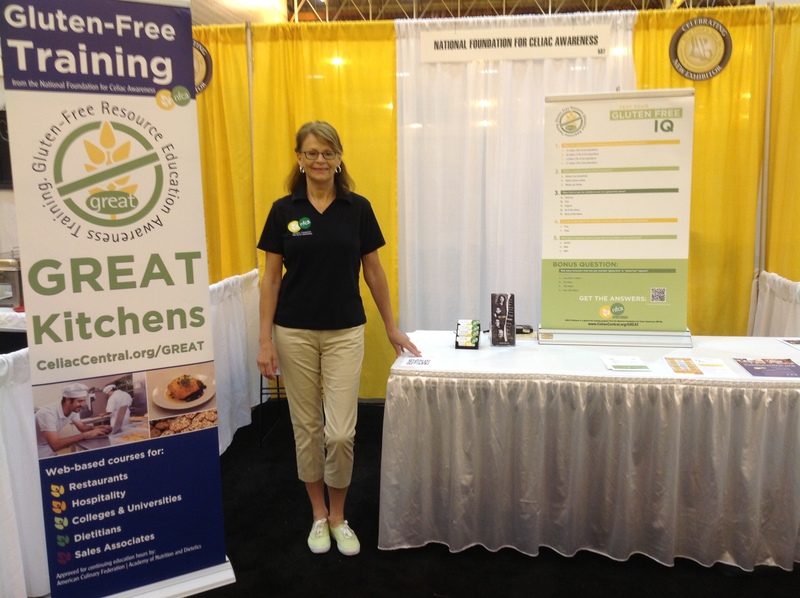 We talked a great deal about the increasing demand and requests for gluten-free options, and how GREAT Kitchens, an online training course from NFCA, would be a valuable tool for staff to learn about safe preparation. When I was able to take a break from the exhibit, I found some tremendous booths showing off their gluten-free spice blends and recipes to create Cajun cuisine so I’m looking forward to putting my samples to good use. 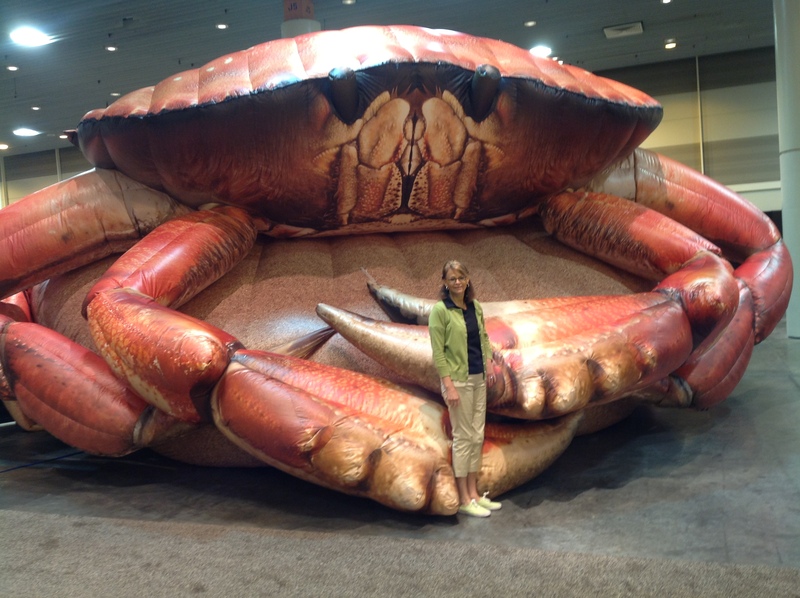 But by the end of the week, I was feeling a bit crabby; swampy heat can take its toll on a woman from Nebraska! 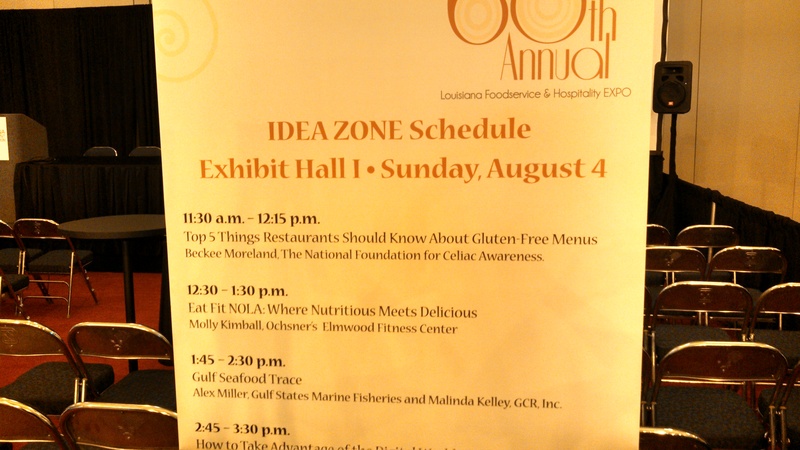 NOLA certainly delivered new flavors, new recipes and new friends – even on a gluten-free diet. By the end of the trip, I was a tad crabby…pun intended.